Jarl of Morthal at the time of the Stormcloak Rebellion in 4E 201. Idgrod claimed to have visions granted to her by the Eight which she relied on in her governance of Hjaalmarch. While she was careful with her words, she was clearly a supporter of the Empire during the conflict, although the Empire itself noted that under pressure, Idgrod would ultimately seek to protect Morthal's–not the Empire's–interests. Her people were largely bemused and frustrated by her indirect leadership during this time of crisis. She had two children with Aslfur, her husband and steward; a daughter, Idgrod the Younger and a son, Joric - both of whom purportedly shared her visions, especially Joric. Aslfur often insisted that he be consulted before his wife if anyone had business with her, as he did not want people to waste her time requesting help with mundane problems, for which he believed they would not understand her advice. Jarl of Markarth at the time of the Stormcloak Rebellion in 4E 201. His father, Hrolfdir, was killed by the Forsworn. Prior to his death, Igmund's father and the Empire established a Nord militia that included Ulfric Stormcloak in order to re-secure control of Markarth, offering the militia the freedom to worship Talos in exchange for regaining control of Markarth from the Forsworn, a promise which could not be kept once the Thalmor objected. Igmund succeeded as Jarl of Markarth at a young age in 4E 176, following in his father's footsteps in siding with the Imperial Legion, and he continued the fight against the Forsworn for the next twenty-five years. Ildari Sarothril was a Dunmer Telvanni conjurer and an apprentice of Master Neloth during the Fourth Era. She was killed during an experiment, but returned to life due to a Heart Stone which had been grafted to her. She was finally slain in 4E 201. Investigator Vale was a fictional Breton detective and the heroine of an eponymous series of mystery novels which were hugely popular during the mid-Second Era. Her adventures took place across Tamriel and often made reference to the current political or social climate. The author of the series was unknown, but some chroniclers claimed it was Lady Arabelle Davaux, a retired soldier of King Emeric's army. Imperial member of the Council of Mages of the Mages Guild in Cyrodiil as of 3E 433. He was a researcher specializing in Ayleid studies. Among other projects, he supervised the excavation of the ruin at Vahtacen and studied artifacts extracted from within. He was killed by necromancers while studying the Bloodworm Helm for a way to defeat Mannimarco. He was the author of Magic from the Sky. 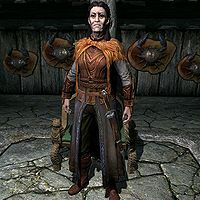 Nord High King of Skyrim during the Fourth Era, he ruled for almost twenty-five years and was considered to be instrumental in keeping the province together during the Great War. Upon his death, the Moot formally named his son Torygg his successor. Iszara was a Redguard leader of the late Second Era who, along with her brother Cyrus, was instrumental in the rebellion of Stros M'Kai against the Imperial occupation. She became the city's ruler, guided by the spirit of her secret lover, Prince A'tor. In this position, she ordered the rebuilding of the city and likely had some part in organizing the First Treaty of Stros M'Kai. ^ Sybille Stentor's dialogue in Skyrim.